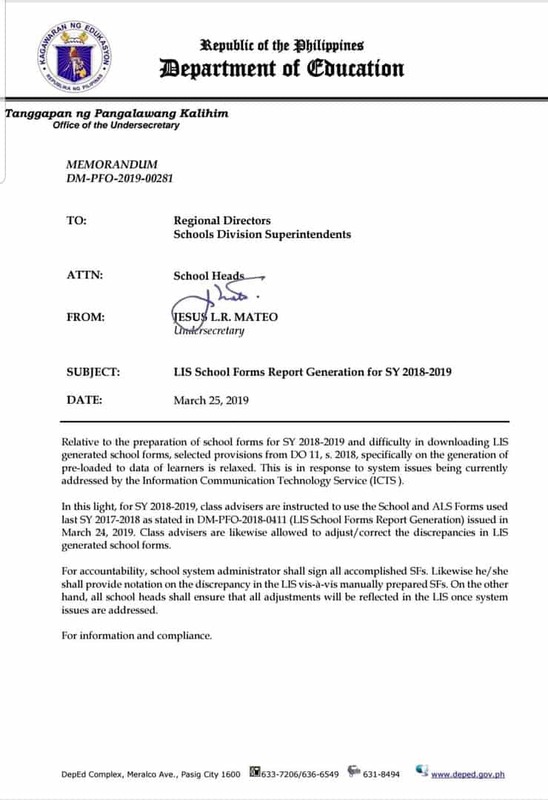 Attached is a Memorandum DM-PFO-2019-00281 from Jesus Lorenzo Ruiz Mateo, DepEd Undersecretary for Planning Service and Field Operations, dated March 25, 2019, entitled “LIS School Forms Report Generation for SY 2018-2019”, which is self-explanatory, for the information and guidance of all concerned. Relative to the preparation of school forms for SY 2018-2019 and difficulty in downloading LIS generated school forms, selected provisions from DepEd Order No. 11, s. 2018, specifically on the generation of pre-loaded to data of learners is relaxed. This is in response to system issues being currently addressed by the Information Communication Technology Service (ICTS). In this light, for SY 2018-2019, class advisers are instructed to use the School and ALS Forms used last SY 2017-2018 as stated in DM-PFO-2018-0411 (LIS School Forms Report Generation) issued in March 24, 2019. Class advisers are likewise allowed to adjust/correct the discrepancies in LIS generated school forms. For accountability, school system administrator shall sign all accomplished SFs. Likewise he/she shall provide notation on the discrepancy in the LIS vis-a-vis manually prepared SFs. On the other hand, all school heads shall ensure that all adjustments will be reflected in the LIS once system issues are addressed. This is in relation to the on-going preparation of End of School Year (EoSY) reports at the school level as stipulated in Deped Order No. (DO) 11, s. 2018. This Office has received feedback, through various channels, on the difficulty in downloading of School Forms (SFs) with pre-loaded data from the Learner Information System (LIS) due to congestion brought about by the huge volume of users and other technical issues. In order to resolve this difficulty, the Information and Communications Technology Service (ICTS) is in the process of undertaking system improvement measures. In the interim, this Office shall allow the relaxing of some provisions of DO 11, s. 2018, particularly item no. 2, paragraphs 2 and 3 on page 4; paragraph 1, sentences 1 to 4 on page 7; and item no. 2.2 on page 8. Class advisers experiencing difficulty’ in downloading of SFs from the LIS may use SFs available through direct download in the DepEd website under the School and ALS Forms section of the Resources tab (http://deped.gov.ph/resources/downloads/school-forms). Class advisers are likewise allowed to adjust/correct the LIS downloaded SFs for the current school year. The instruction for the school system administrator to sign/initial on tire SFs shall remain in effect In addition, he/she must also affix a notation on each record with discrepancy’ in the system vis-a-vis manually-prepared/adjusted SFs. The school head, being the official accountable for all learners’ records in the school, shall ensure all necessary’ adjustment will be done once LIS normalizes. All other provisions of DO 11, s.2018 shall remain in effect and shall be implemented in full beginning SY 2018-2019.